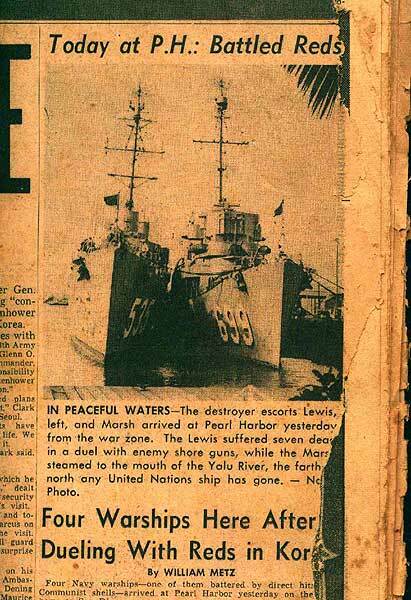 Tactical Voice Radio Call: "Obey"
23 June 1943: Keel laid by the Defoe Shipbuilding Co., Bay City, Mich.
15 August 1958: Decommissioned, placed "In Service" and assigned as NRT ship, 12th Naval District at Long Beach, Cal. 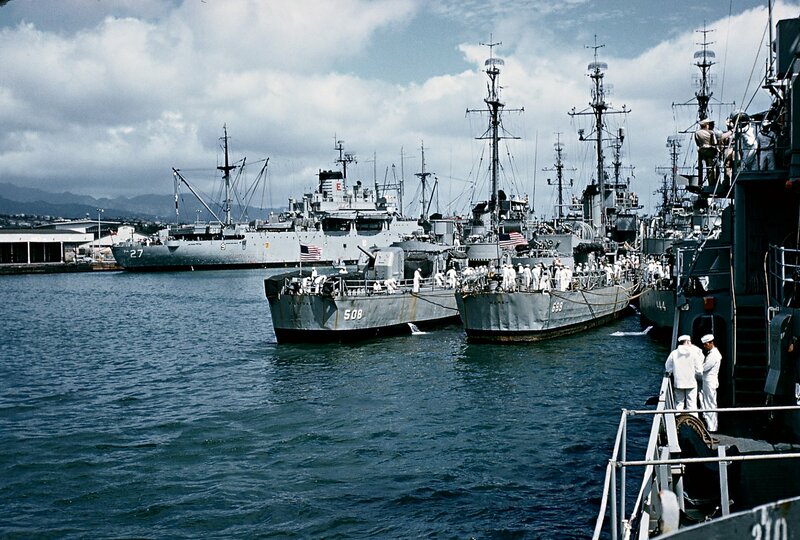 15 December 1961: Recommissioned due to the Berlin Crisis, homeport reassigned to Pearl Harbor, Hi. 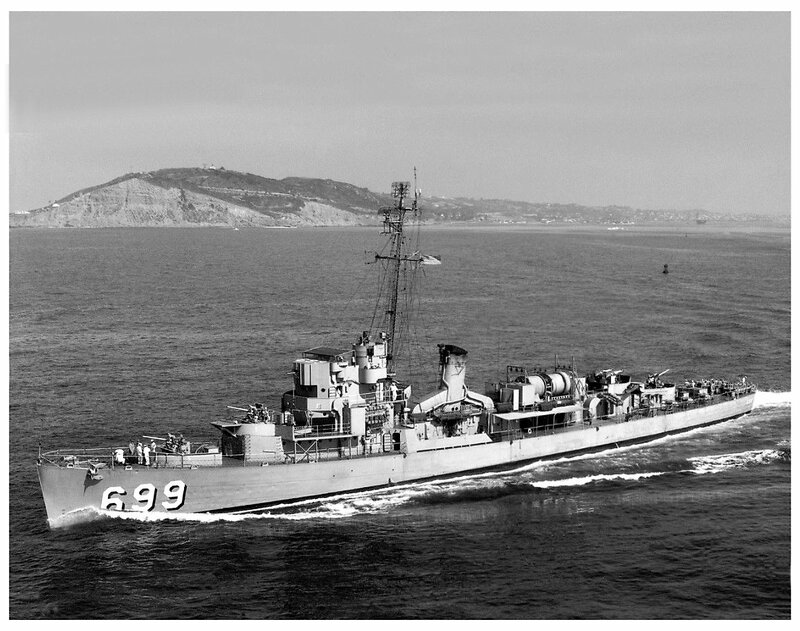 01 August 1962: Decommissioned, placed back "In Service" at Long Beach, Cal. 75k Benjamin Raymond Marsh, Jr. was born 11 October 1916 in Lansing, Michigan to Mr. Ben & Mrs. Marjory Marsh. He attended the University of Wyoming from Fall of 1935 to Spring of 1936 and transferred to the College of Engineering at the University of Michigan, attending from 1936 to 1938. He was an active member of the Alpha Tau Omega National Fraternity. He enlisted in the Naval Reserve 17 August 1940 at Detroit and completed his enlistment 13 February 1941 following his initial training aboard the USS Arkansas. He was appointed midshipman in the U.S. Naval Reserve the following day, receiving his commission as ensign 15 May 1941 after completing all required courses at the Naval Reserve Midshipmen’s School, U.S. Naval Academy, Annapolis, Maryland. 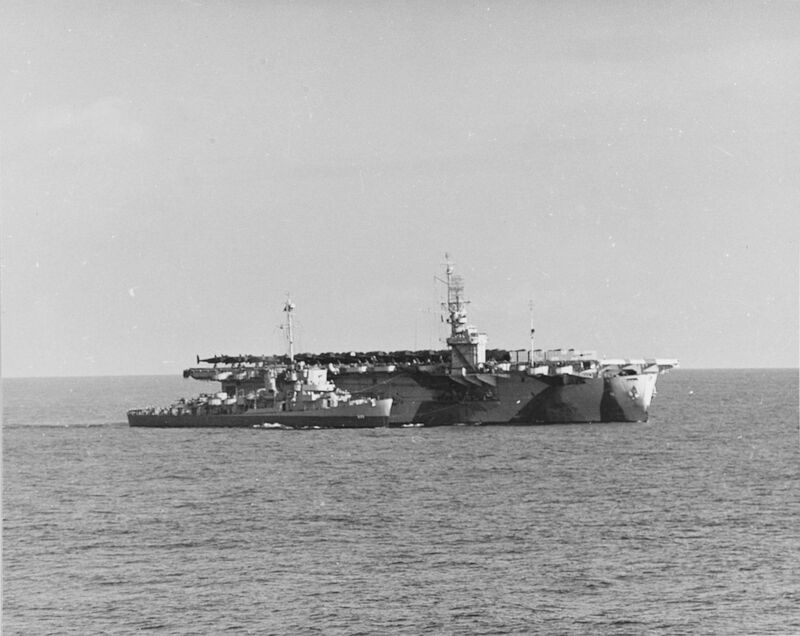 Initially assigned to USS Tangier on 15 May 1941, he was transferred 04 November 1941 to USS Arizona. Ensign Marsh was declared dead following the attack on Pearl Harbor, 07 December 1941. He was posthumously awarded the Purple Heart by General Order #186 on 21 January 1943 so ordered by the Secretary of the Navy. Also awarded posthumously was the American Defense Service Medal with Fleet Clasp and the World War II Victory Medal on 18 November 1946. 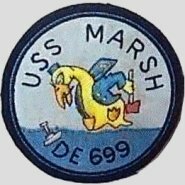 USS Marsh (DE 699) (1944-1973) was the first ship to be named in his honor. 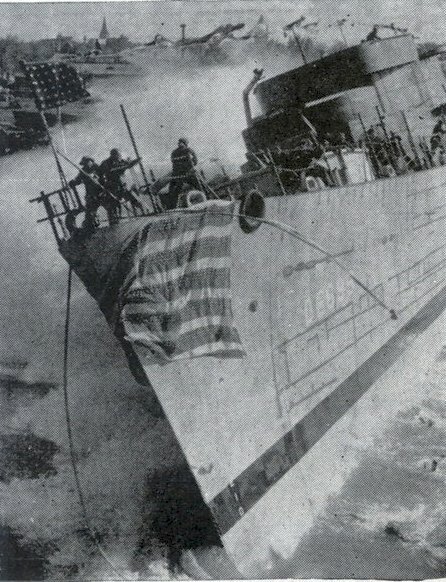 93k 25 September 1943: Bay City, Mich. - USS Marsh slides sideways into the water at Defoe Shipbuilding after being christened by Mrs. Ben Marsh. 120k 02 June 1944: USS Tulagi (CVE 72) enroute from New York to Casablanca with a deck cargo of U.S. Army P-38s and P-47s. 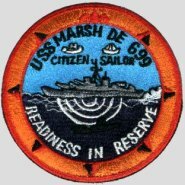 USS Marsh (DE 699) is alongside. 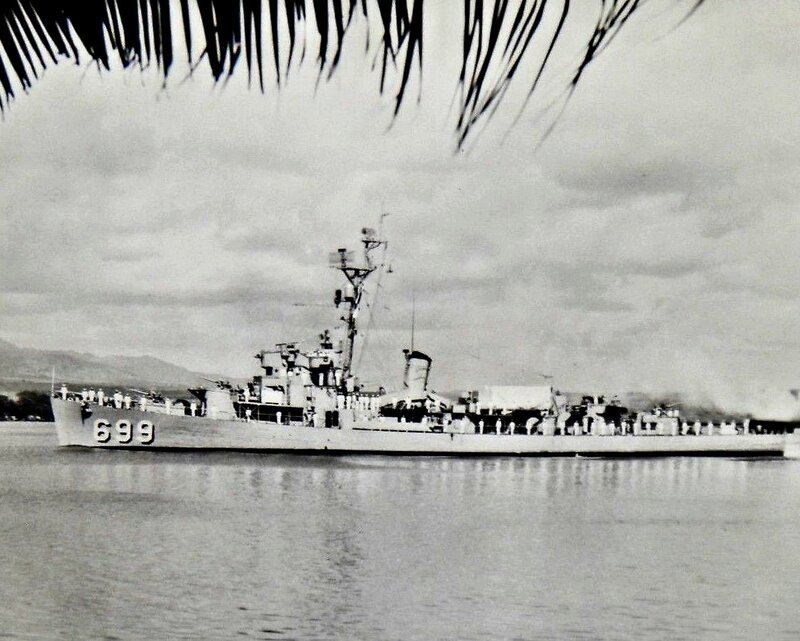 Photographed from USS Mission Bay (CVE 59). 113k A later bow view of Marsh, which illustrates the divergence of naval staff views between the Royal Navy and the U.S. Navy at war's end, in dealing with the fast U-boats. While the Royal Navy went in for the Squid mortars, the U.S. Navy relied on the Hedgehog, and here two are fitted side by side in the B position. 51k One of the floating power stations, Marsh of the 'Buckley' type. 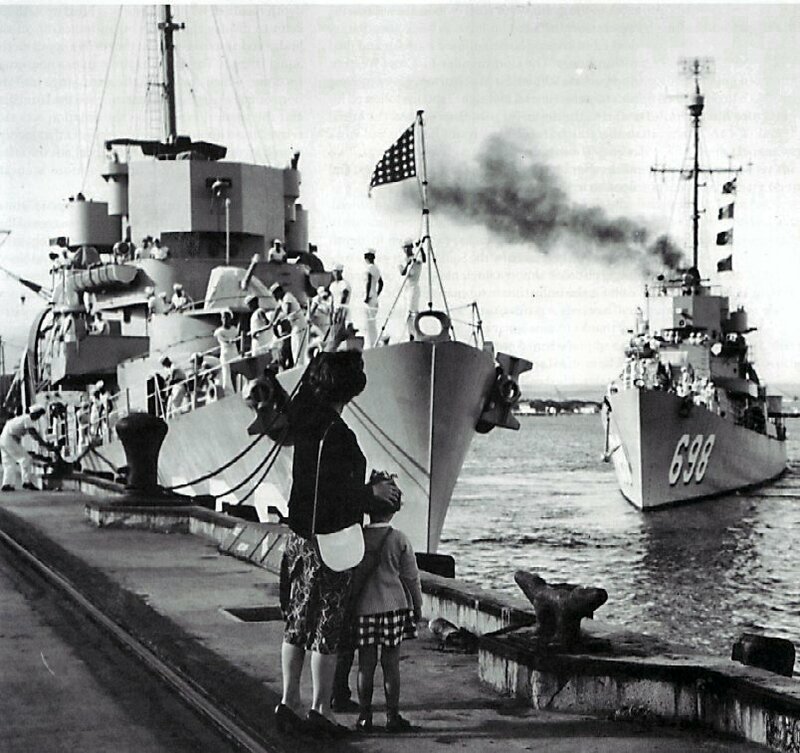 Taken in Hawaii, this shows the power points in place of the torpedo tubes, a new type bridge and postwar radar aerials at the masthead. 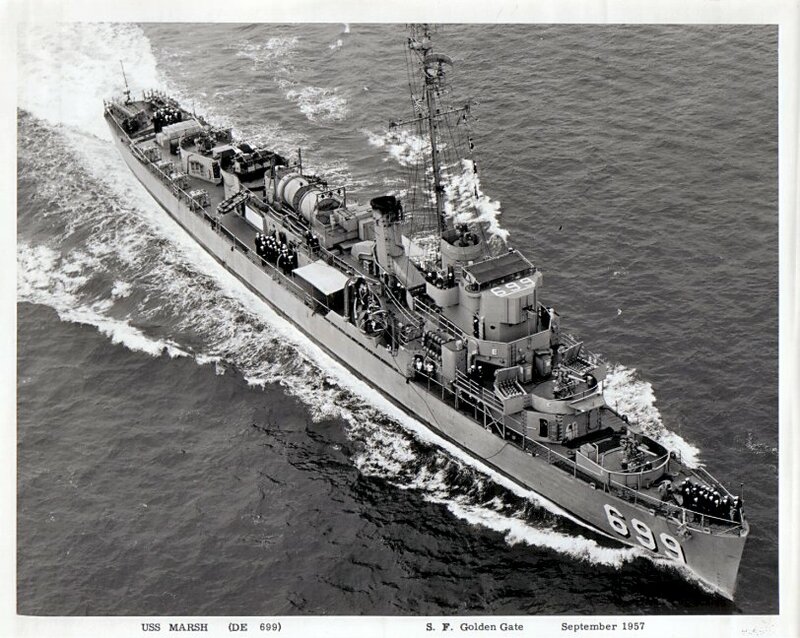 225k Post-Korean war photo of Marsh passing Point Loma, departing from San Diego. 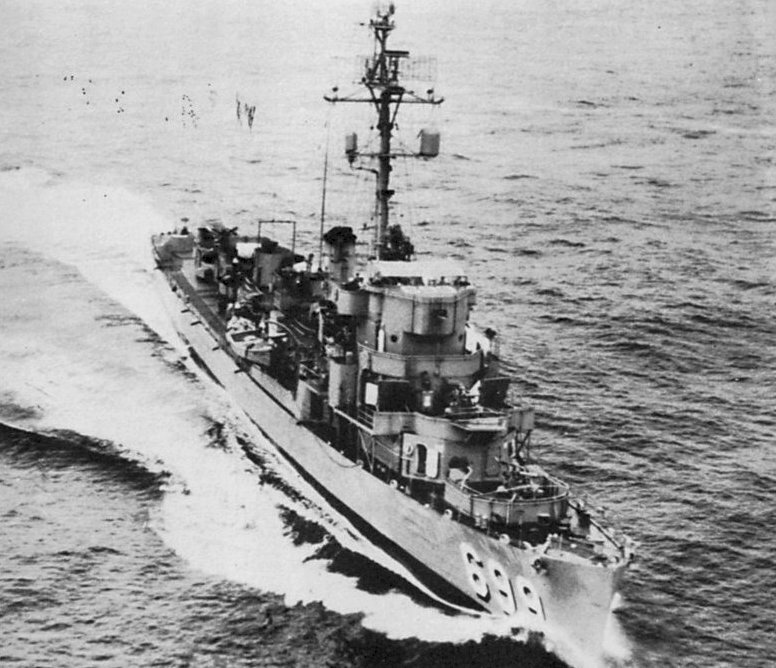 132k undated: USS Raby (DE 698) going full astern prior to departing Pearl Harbor. In the foreground is Marsh with crewmen preparing the ship for departure. 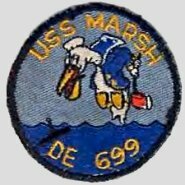 View the USS Marsh (DE 699) DANFS history entry located on the Naval History and Heritage Command web site. 9.) 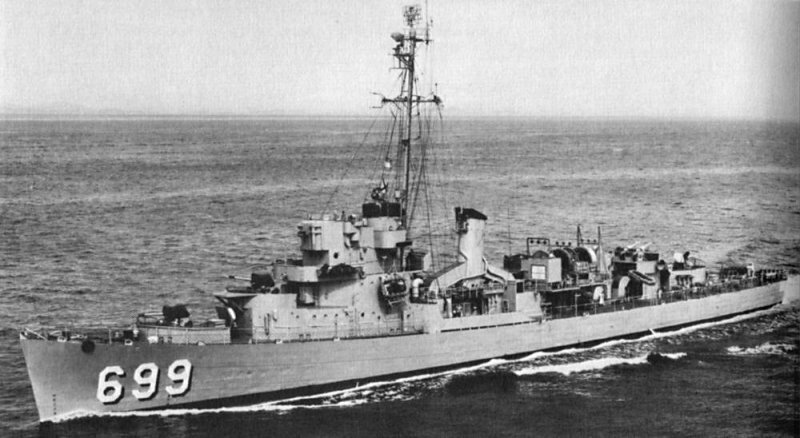 .. .... 1949 - Lcdr. Everrett Earl Roberts Jr. 10.) 01 Jun. 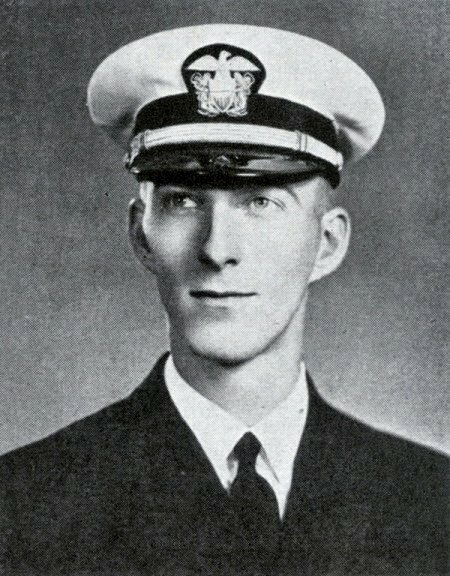 1951 - .. Nov. 1952 Lcdr. Antoine William Venne Jr. 14.) 10 Feb. 1961 - Cmdr. Perry R. Kornegay Jr.